We had good attendance at our Member Meeting, but many of our 370+ members did not attend. To learn what was discussed at the meeting, click this link to the presentation from the November meeting. Dave will offer 2-hour clinics for 2.0-3.5 players and for 3.5-4.0 players. If there is enough interest, he will also offer a clinic for 4.0 and higher. These clinics are fast paced and you will learn how to execute his pickleball concepts. Clinics are $30 per person. Hourly lessons for small groups are also available at $30 per person. Sign-up links will be available in the next newsletter. 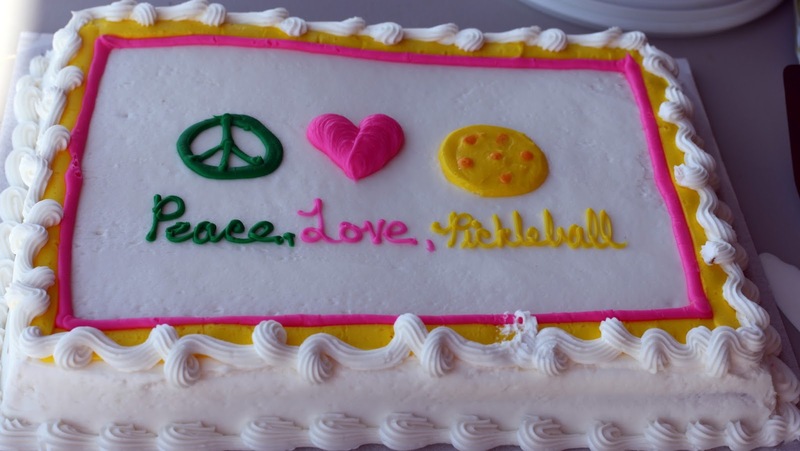 Our pickleball courts will have their 4th birthday in December of this year. We always hold a party to celebrate the opening of the courts and the beginning of our Club. Volunteers are needed to organize this party. You can pick the date, time of day to play, the format of play, what type of food you want members to bring, and even design and order a birthday cake (at the Club's expense, of course!). The Club will set up the Sign-up for you, and you can ask members to volunteer to set up, clean up, register participates, and anything else you like. Take advantage of this opportunity to plan this birthday party by contacting Sandy Veydt, at sandysway88@gmail.com. Beginner Drills and Assisted Play will not be held this week because of Thanksgiving. After that, Beginner Drills (for people who have taken a beginner lesson) will be held on Tuesday and Saturday from noon until 2 PM on Courts 9-12 on Tuesday and Courts 5-8 on Saturday. Assisted Play will be on Thursdays from 1 PM to 3 PM on Courts 5-7. This is for anyone who has some playing experience and/or has taken a beginner lesson. Sign-up is required for Assisted Play. The link will be available in the next newsletter. Separate drills will be held for 3.0 and 3.5 players on Friday on November 24 and December 1 and Courts 10-12. The drills for 3.0 players will be from 2:00 to 3:15 and will be limited to 12 players. The drills for 3.5 players will be from 3:15 to 4:30 and will be limited to 8 players. The Link to sign-up is available now for the November 24 session. Sign-ups for the December 1 session will open on Saturday November 25 at 11 AM. Click here to sign up for the November 24 session. The Club is able to do a lot because many of our members step up and volunteer. Volunteers are needed in several different areas. Contact Jean Bustard if any of these volunteer opportunities are right for you, jeanb@dcmesa.com. We are changing our court reservation system to the Northstar system, which is now used in all Robson communities. If you are a techy, please step up and help out with our transfer to this system. We have twice requested money to provide shade awnings between Courts 5-8 and 9-12, but we have not received funding for this fairly expensive item. But we may be able to provide some shade using our own funds. We need a small group of creative people to consider options to the expensive shade awning project that has been rejected. If you're creative and get hot sitting in the sun, please volunteer for this project. Each year, we have offered club shirts for sale. We would like to do this again, but we need a volunteer or two to organize this sale. We already have the logo design for the shirts, so creativity isn't needed for this. If you're a good organizer, this is the job for you! We need volunteers to organize socials next year. We would like to do something the third Wednesday of each month, either a very casual social where we come and play and meet afterwards for drinks and snacks to more elaborate socials with decorations and planned eats. If you would be interested in organizing a social for any month in 2018, contact our new Social Chairpersons, Susie Eckhardt, susan.eckhardt@yahoo.com, or Barb Havel, bdhavel41@gmail.com. We will also continue to have a social following the Round Robins on Wednesdays. Contact Karen Morse if your are interested in helping out with these social events, morse99004@me.com.